Smaller size, lighter weight... perfect for their first gun! Ideal for youth and smaller hunters! The Savage Axis Youth .223 Remington Bolt-action Centerfire Rifle is a great way for youngster and smaller-framed shooters to shoulder the quality and dependability of a Savage in a size and configuration that meets their needs. Axis Youth Rifles are lighter, shorter and easier to handle, which helps new shooters feel more comfortable behind the gun. Plus, their affordable price makes them ideal entry-level hunting rifles. This model includes a factory-installed Weaver 3-9x40mm Scope, so it's ready to hunt, right out of the box! 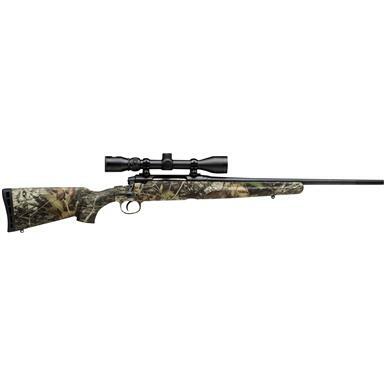 Youth Savage Axis XP, Bolt Action, .223 Remington, 20 Barrel, 3-9x40mm Scope, 4+1 Rounds is rated 3.0 out of 5 by 1.